Regardless of whether or not you're in a long distance relationship (or LDR for short), communication is hands down the most important part of a relationship. And when you're away from your significant other, it becomes that much more important because if you two slack on communication, limit communication (as in how much you tell each other), or just don't do it at all, then your relationship is doomed for failure. 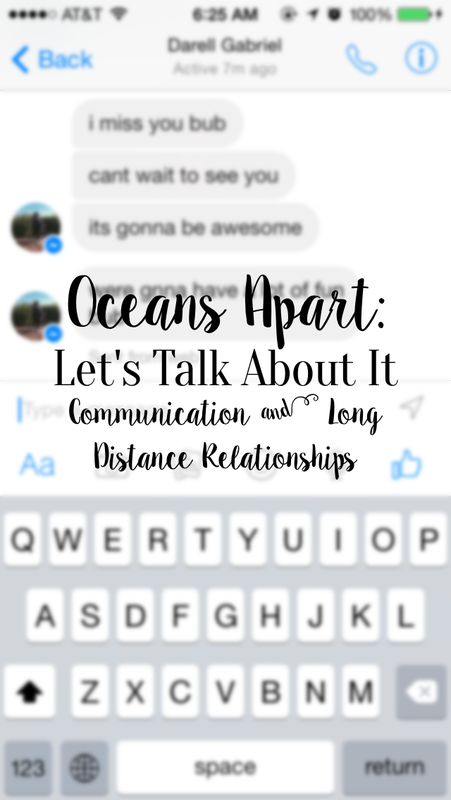 In an LDR, communication becomes that much more important because most of the time you can't see or physically be with that person, so what you say (or don't say) makes that much more of a big deal. It has been almost 2 months since Darell has left to go down under, and I have to say that we've been pretty well lately! The first couple of weeks were tough because we weren't talking much mostly due to Darell adjusting to his new schedule and just being very busy, but now that he has settled into his new home and now that I am getting back into the swing of school and work, we both have developed our system when it comes to talking. Now while we don't have a set schedule for when to talk, we usually communicate throughout the day as we can like how we normally would. With the time difference I basically go through my mornings & sometimes afternoons with him sleeping while for him, it's his evenings that are when I'm sleeping. I have school and work to keep me busy while he's usually just hanging out with his friends at home or sometimes at church/school. My biggest recommendation for communication in long distance relationships: Don't get butthurt if your partner is too busy to talk every now and then. Now I say this for myself as well because there are definitely times when Darell's schedule is so busy or he goes long periods without wifi (we can only talk if he has it) and sometimes, being the person that I am, I overthink the situation way too much and I think the worst of it. I'll admit, sometimes it definitely is hard enough that I can't talk to him whenever I want because of the time difference, but because of international charges we are also even more limited when we talk. However, I think the biggest positive out of the situation is that when we do talk, our conversations are usually cute and fun! It's safe to say that we both appreciate them that much more. Some other tips for successful communication in LDR's: - OPENNESS AND HONESTY. Darell and I make it a point to be open and honest about everything, even if it might hurt. We try our best to be transparent with each other, because we all know that hiding things even if its to protect that person usually does more harm than good in the end. - DON'T STRESS TOO MUCH ON EVERYTHING THAT CAN GO WRONG. This was me in the beginning right after Darell left. If you keep bugging that person and getting on their case about everything that could go wrong, it just doesn't make for healthy or productive conversation. It will most likely end in a fight and because of the distance, it's so much easier to ignore the other person. I'm not saying it's the best, healthiest, or right way to handle this kind of situation, but we are human and do things without thinking when we're mad sometimes. - TAKE ADVANTAGE OF SOCIAL MEDIA. I think I'm going to write a completely separate post detailing how much social media helps in long distance relationships. It's such a blessing for us to be living in this time where you can instantly talk to or even "see" someone on the other side of the world through a portable device. It's pretty great. Whether it's Facebook, Twitter, Snapchat, or even Periscope, use these platforms to help your relationship not feel so far away. - KEEP ROMANCING YOUR S/O EVEN IF YOU'RE APART. For me, when Darell leaves me sweet messages to wake up to, that's his way of making me feel loved and it's a cute surprise to wake up to. For me, it's a little bit harder to speak his love language but when I do something for him here at home or keep him updated with everyone back home, he still feels very apart of life in the US, sorta. Haha. So whether it's surprising them with unexpected love posts on social media, or sending a care package, or whatever you know they will love and appreciate, do it. Don't just get comfortable, keep loving them and keep showing it too, because it's very easy to forget that when you're both apart and on completely different schedules. Those are my tips for now! The biggest struggle is just not being able to hug or kiss him when I want. Other than that, the open and constant communication makes us feel like we are both still apart of each others' lives, and that's how it should be in an LDR. They are still part of your life, they're just not physically there, and it's important to show them that they still mean something to you. Anything else about communication in LDR's I missed? Let me know! New Music with Nichole Nordeman + a Giveaway!